Note: the final approved version of MC2010 is published as Bulletins 65 and 66. 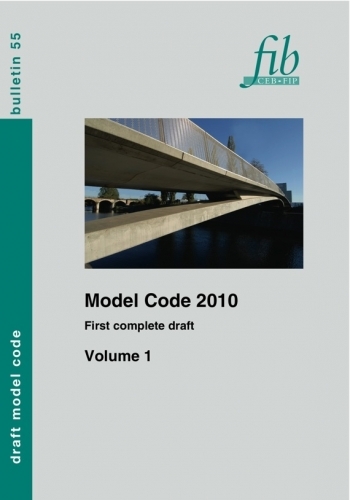 Bulletin 55 is the first volume of the first draft of the fib Model Code for Concrete Structures 2010. The definitive hardcover and e-book editions of the fib Model Code for Concrete Structures 2010, which contain all revised volumes (Bulletins 55, 56, 65 and 66), are available at Ernst & Sohn publishing house. The Model Code for Concrete Structures is intended to serve as a basis for future codes. It takes into account new developments with respect to concrete structures, the structural material concrete and new ideas for the requirements to be formulated for structures in order to achieve optimum behaviour according to new insights and ideas. It is also intended as a source of information for updating existing codes or developing new codes for concrete structures. At the same time, the Model Code is intended as an operational document for normal design situations and structures. This edition of the Model Code gives an extensive state-of-the-art regarding material properties for structural concrete. This includes constitutive relations for concrete up to strength class C120, and properties of reinforcing and prestressing steel, including prestressing systems. Special attention is given to the application of fibre concrete for structural applications, the application of non-metallic reinforcement, interface characteristics, verification assisted by numerical simulations, verification assisted by testing, and to a number of important construction aspects. The Model Code 2010 is more 'life cycle' oriented than its predecessors. Reliability plays an important part: various methods are offered to cope with this aspect. The design of concrete structures is described for a large number of conditions. Design criteria are given with relation to reliability, functionality, durability and sustainability, where the last category is in the state of development. The chapter on conservation of structures provides insights into the degradation of concrete as a function of various types of environmental conditions. Attention is given to non-traditional types of reinforcement as well, like steel fibres and FRP, which have reached a status of recognition in the previous years. Design rules for serviceability and ultimate limit states are given for a wide range of conditions, such as static and non-static loading (fatigue, impact and explosion, earthquake), high and low temperatures (fire and cryogenic). Furthermore limit states for durability are given. Design for sustainability will be an important task in the future; here some initial ideas are given. Design for robustness is also given due attention. This document is the first complete draft of the fib Model Code 2010, and as such, it is open to suggestions for improvement. After comments and feedback have been received from the fib Commissions and duly taken into consideration, the final document will be submitted to the fib General Assembly for approval and then publication as the final version of the fib Model Code 2010.